The Red Carpet event promoting “The Book Thief” was part of the Chicago International Film Festival on October 22, 2013. Interviews included cast member Sophie Nélisse, with producer Karen Rosenfelt and director Brian Percival of “Downton Abbey” fame. At thirteen years of age, actress Sophie Nélisse has emerged as a rising star that continues to soar. She’s won Canada’s Genie Award for her performance in the film Monsieur Lazhar and became the youngest winner in the history of the award ceremony. When Brian Percival, director of The Book Thief, scoured Europe, Australia, Canada, and elsewhere looking for a child actress, he should have started in Canada, as when he auctioned Nélisse, he knew he’d found his lead actress. She walked the Red Carpet on October 23, 2013 in Chicago at the AMC Theater during the Chicago International Film Festival. This confident, blonde, young lady handled herself with ease. She has immense admiration for the character she portrayed in the film and has a love of books herself. Sarah Knight Adamson: Hi, Sophie. Were you in Hollywood last night, receiving an award at the Hollywood Film Awards? SA: You play such a strong character in the film, The Book Thief. Can you tell us a little bit about your character? SN: She’s strong-minded and she won’t let anything drag her down. I also think what’s great about her is she uses all these little things that she gets to create another thing that is bigger. Reading books is something that she had at that time and it’s not a lot, but to her, it’s so powerful and it makes her see life in a different way and that’s what’s going to make her survive. Also, if she has a goal, she’ll go all the way through and make it. I think she’s an inspiration to everybody – she sends such a good message to adults and kids. SA: That leads right into my next question. What message do you think kids your age will take away from this movie? SN: The message is that in every bad situation: there is always good or positive that comes out of it. Even if you don’t have a lot, you should always find the little things that will make you happy. I mean, it’s not because you’re rich that you’re going to be happier. She was really poor and the books made her survive. The whole story, the power of books, is really an important message. SA: How do you identify with your character? Do you read a lot? SN: Yes. I try not to go on an iPad, iPhone, or computer too much because we really have to try and keep books and I love to read, especially if it’s a good book. I think that I’m strong-minded and if I have a dream, it will come true some day. SA: Thank you so much for speaking with me and best of luck with the movie! I’m introduced to Karen Rosenfelt. Sarah Knight Adamson: Hi, Karen. What an amazing movie! How did you get involved with it? Karen Rosenfelt: Ken Blancato, the other producer, and I read the manuscript before it was published because we read a blurb in the Wall Street Journal and that Little, Brown was publishing it as its first YA novel, which surprised us. So we read the book and it just resonated with us, so we thought we should try to tackle this as a film. Elizabeth Gabler at Fox 2000 shared our passion, so eight years later, we have a film in the theater. SA: What ages do you recommend for this film? KR: It depends on the younger members of the audience because some ten-year-olds have older siblings and aspire up and can handle the thematics, but I would say thirteen and up. SA: I think that’s a safe bet because I used to teach gifted nine- and ten-year-olds and sometimes it depends on the parents as well. KR: Yes, it’s a movie that should not only resonate with a thirteen-year-olds, it should resonate with an eighty-year-old, because it’s about ordinary people in an extraordinary situation and they didn’t ask for this. They were just living their lives on Himmel Street. SA: What do you hope that people take away from this film? KR: Humanity. Just as Liesel says to Hans at the end of the movie, while sitting at the table, “This is what people do.” And if they read, then they would further understand the power of words. SA: Thank you so much for speaking with me and good luck with the film! 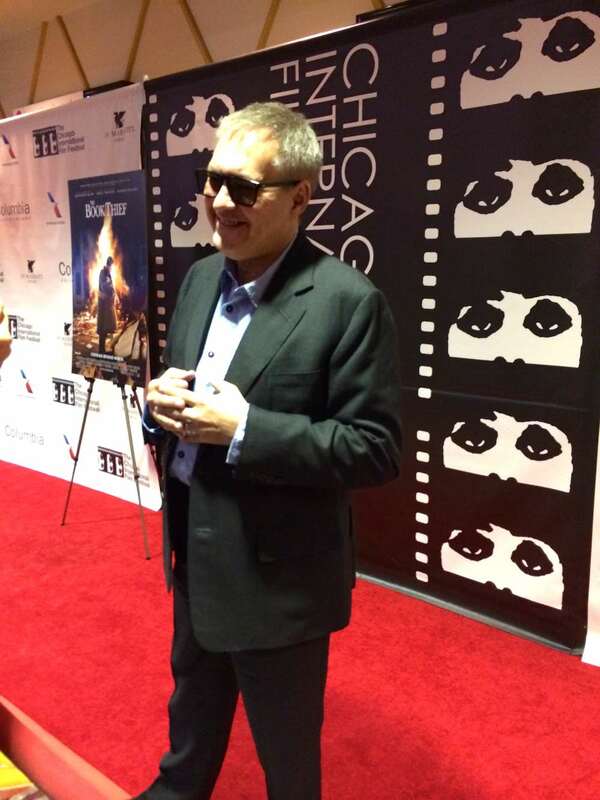 Director Brian Percival arrives on the Red Carpet. Sarah Knight Adamson: Hello, Brian. It’s so wonderful to meet you. Brian Percival: Hi, Sarah. You as well. SA: When you read the script for the first time, I would imagine that certain shots or images were going through your mind. Did any of them make it into the film? Could you please speak to that? SA: Because of the tough subject matter, were there days that were difficult on the set? BP: The only difficulty we had was sometimes the weather temperatures. The scene that was probably the toughest to film was the book burning because it was nineteen degrees below zero. It was very cold and we were there at four a.m., and there were five hundred actors that were just shivering! SA: The choosing of your main character; how did that come about? BP: It was a very, very long search. We started out in England, then rolled out across Europe to Germany, France, Austria, Switzerland, and Scandinavia. We didn’t find what we were looking for, so we moved on to America, Australia, and Canada, and eventually, we found Sophie. We had a problem with finding the right Liesel because not only does she need to be the right age ten, but she needs to play sixteen as well. She also needs to have a really vulnerable side to her character that makes us feel for her, but a very feisty side that we cheer for. And most of the kids that we had seen were either one or the other. We needed somebody who could do both and, thankfully, we found that. SA: Thank you so much and best of luck with the film!